Program Co-Chair of the 17th IEEE International Conference on Machine Learning and Applications (ICMLA) 2018, Orlando, Florida, U.S.A.
Co-Organizer of the Special Issue on 'Advanced Soft Computing for Prognostic Health Management' in Applied Soft Computing (9 papers accepted). Co-Organizer of the Special Issue on 'Big Data and Situation-Aware Technology for Smarter Healthcare' in Journal of Medical and Biological Engineering (15 papers accepted). Co-Organizer of the Special Issue on 'Online Real-Time Learning Strategies for Data Streams' in Neurocomputing Journal (10 papers accepted). Co-Organizer of the Special Issue on Data Stream Mining and Soft Computing Applications in Applied Soft Computing Journal (15 papers accepted). Co-Organizer of the Special Issue on 'Hybrid and Ensemble Techniques in Soft Computing: Recent Advances and Emerging Trends' in Soft Computing Journal (21 papers accepted). Co-Organizer of the Special Issue 'Evolving Soft Computing Techniques' at the Applied Soft Computing Journal (Elsevier) (16 papers accepted). Co-Organizer of the Special Issue ’On-line Fuzzy Machine Learning and Data Mining’ at the international journal Information Sciences (Publisher: Elsevier, 15 papers accepted). Edwin Lughofer and Moamar Sayed-Mouchaweh, Predictive Maintenance in Dynamic Systems --- Advanced Methods, Decision Support Tools and Real-World Applications, ca. 592 Pages, ca. 200 Illustrations, Springer New York, to appear, March 2019. Edwin Lughofer, Evolving Fuzzy Systems - Methodologies, Advanced Concepts and Applications, Springer Verlag, Berlin Heidelberg, 2011, ISBN: 978-3-642-18086-6, 460 pages, 148 figures, 263 images, 26 tables (cited 320, Google Scholar, "h"). E. Lughofer and M. Sayed-Mouchaweh. Prologue --- Predictive Maintenance in Dynamic Systems. Predictive Maintenance in Dynamic Systems, editors: E. Lughofer and M. Sayed-Mouchaweh, Springer, pp. 1-23, 2019. E. Lughofer, A.C. Zavoianu, M. Pratama and T. Radauer. Automated Process Optimization in Manufacturing Systems based on Static and Dynamic Prediction Models. in: Predictive Maintenance in Dynamic Systems, editors: E. Lughofer and M. Sayed-Mouchaweh, Springer, 486-531, 2019. M. Pratama, A. Ashfahani, E. Lughofer and S. Huang. An Evolving RFID Localization Model in The Manufacturing Shopfloor. in: Predictive Maintenance in Dynamic Systems, editors: E. Lughofer and M. Sayed-Mouchaweh, Springer, pp. 287-309, 2019. Edwin Lughofer, Robust Data-Driven Fault Detection in Dynamic Process Environments Using Discrete Event Systems. in: Diagnosability, Security and Safety of Hybrid Dynamic and Cyber-Physical Systems, editor: M. Sayed-Mouchaweh, pp. 73--116, 2018. Mu-Yen Chen, Edwin Lughofer, N.Y. Yen and C.-C. Chen, Guest editorial: Human behavior analysis for library and information science. Library Hi Tech, Vol. 35 Issue: 4, pp.442-444, 2017, https://doi.org/10.1108/LHT-10-2017-0213. Edwin Lughofer, Human-Inspired Evolving Machines - The Next Generation of Evolving Intelligent Systems?, IEEE SMC newsletter, vol. 36, 2011. J. Liu, E. Lughofer, X. Zeng and Z. Li. The Power of Visual Texture in Aesthetic Perception: an exploration of the predictability of perceived aesthetic emotions. Gabriel Kronberger*, Michael Kommenda, Edwin Lughofer, Susanne Saminger-Platz, Andreas Promberger, Falk Nickel, Stephan Winkler and Michael Affenzeller, Using Robust Generalized Fuzzy Modeling and Enhanced Symbolic Regression to Model Tribological Systems, Applied Soft Computing, vol. 69, pp. 610-624, 2018. Mahardhika Pratama*, Edwin Lughofer, Plamen Angelov and Meng Joo Er. Parsimonious Random Vector Functional Link Network for Data Streams. Edwin Lughofer*, Carlos Cernuda, Stefan Kindermann and Mahardhika Pratama, Generalized Smart Evolving Fuzzy Systems, Evolving Systems, vol. 6 (4), pp. 269-292, 2015, doi: 10.1007/s12530-015-9132-6 (cited 76, Google Scholar, "h"). Edwin Lughofer* and Moamar Sayed-Mouchaweh, Autonomous Data Stream Clustering Implementing Split-and-Merge Techniques - Towards a Plug-and-Play Approach, Information Sciences, vol. 204, pp. 54--79, 2015 (cited 71, "h", Google Scholar). (cited 38, Google Scholar, "h"). Mahardhika Pratama*, Sreenatha Anavatti, Edwin Lughofer, C.P. Lim, An Incremental Meta-cognitive-based Scaffolding Fuzzy Neural Network, NeuroComputing, vol. 171, pp. 89-105, 2016, doi:10.1016/j.neucom.2015.06.022 (cited 47, Google Scholar, "h"). 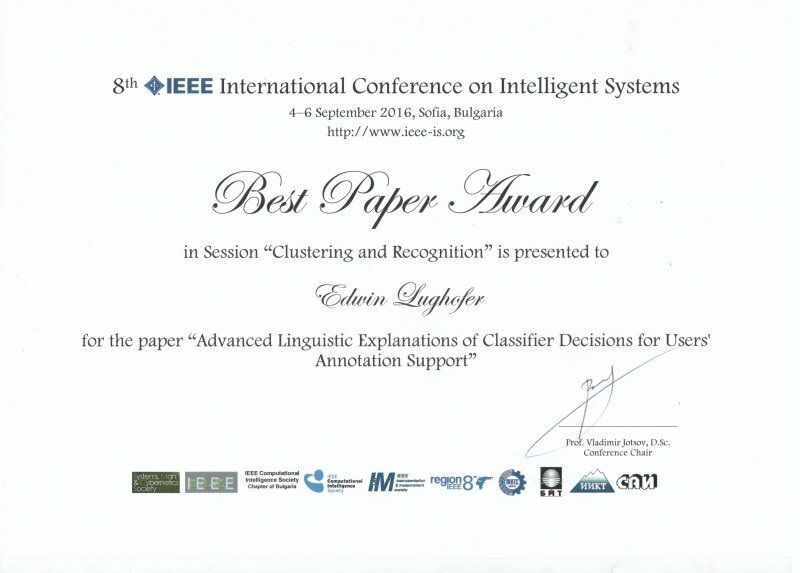 Mahardhika Pratama*, Sreenatha.G.Anavatti, Meng Joo Er and Edwin Lughofer, pClass: An Effective Classifier for Streaming Examples, IEEE Transactions on Fuzzy Systems, vol. 23 (2), pp. 369-386, 2015, (cited 59, Google Scholar, "h"). Ammar Shaker and Edwin Lughofer*. Self-Adaptive and Local Strategies for a Smooth Treatment of Drifts in Data Streams, Evolving Systems, vol. 5 (4), pp. 239-257, 2014, doi: 10.1007/s12530-014-9108-y (cited 41, Google Scholar, "h"). Alexandru-Ciprian Zavoianu*, Edwin Lughofer, Gerd Bramerdorfer, Wolfgang Amrhein, Erich Peter Klement, DECMO2 - A Robust Hybrid and Adaptive Multi-Objective Evolutionary Algorithm, Soft Computing, vol. 19 (12), pp. 3551-3569, 2015, doi: 10.1007/s00500-014-1308-7 (cited 32, Google Scholar). Edwin Lughofer* and Oliver Buchtala, Reliable All-Pairs Evolving Fuzzy Classifiers, IEEE Transactions on Fuzzy Systems, vol. 21 (4), pp. 625-641, 2013. Wolfgang Heidl*, Stefan Thumfart, Edwin Lughofer, Christian Eitzinger and Erich Peter Klement, Machine Learning Based Analysis of Gender Differences in Visual Inspection Decision Making, Information Sciences, vol. 224, pp. 62-76, 2013, doi: http://dx.doi.org/10.1016/j.ins.2012.09.054. Mahardhika Pratama, M.J. Er, X. Li, Richard J. Oentaryo, Edwin Lughofer and Imam Arifin, Data Driven Modeling Based on Dynamic Parsimonious Fuzzy Neural Network, NeuroComputing, vol. 110, pp. 18-28, 2013, http://dx.doi.org/10.1016/j.neucom.2012.11.013 (cited 43, Google Scholar, "h"). DOI: 10.1016/j.chemolab.2011.07.004 (cited 33, Google Scholar). Plamen Angelov, Veniero Giglio, Carlos Guardiola, Edwin Lughofer*, and Jose Manuel Lujan. An approach to model-based fault detection in industrial measurement systems with application to engine test benches. Measurement Science and Technology, Vol. 17, pp.1809-1818, 2006 (cited 49 times, Google Scholar, "h"). Proceedings of the International Conference on Computational Statistics (COMPSTAT), 2018.